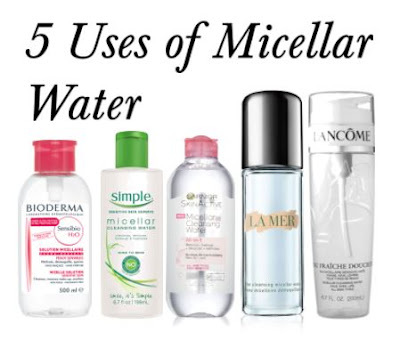 Micellar Water is a beauty game changer. This product has been in the market for years, however it did not receive the recognition it deserves until recently. Micellar water is made up of micelles (tiny balls of cleansing oil molecules) suspended in soft water. The micelles attracted to oil and dirt, so they are able to clean out impurities without disturbing the skin's condition. In a typical fashion, the micellar water is used as makeup remover. It is best use with cotton pad. The micellar water effectively removes makeups and leave all the residue on the cotton pad. It can also be used as double cleansing prior to washing your face. Because of its ability to attract impurities and remove makeups, it can also be used as brush cleanser. Put the micellar water in a small cup, soak the brush bristles in the cup for five minutes. The makeups should be easily washed off with warm water. The micellar water does not change the condition or pH level of the skin. It is perfect to be used as a toner. It leaves the skin hydrated and moisturized throughout the day. If you accidentally stain your clothes with coffee or greasy food, take a kitchen towel and saturate it with the micellar water. Press it against the stained area for a minute. Then rub the cloth in a circular motion. It should remove most of the stain and the stain is easier to wash off later. You can also use it to clean your vanity table that has been stained with makeups. Running out of hand wipes? Use the micellar water. The concept is the same. If it removes dirt from your face, it should do the same to your hands. It isn't the most economical way to clean your hand, but when emergency strikes, you know you can rely on micellar water. Have you use micellar water before? My favourite is the Garnier (pink bottle) one.